Jen Palmer and I will be collaborating on a live painting, starting at 8 p.m. Hope yinz will swing by and say hi as you check out the cool art and music at Art All Night. Join us for a new season of the Neighborhood Flea! Shop, eat, workshop, treasure hunt and grab delicious goodies to go. The Neighborhood Flea takes place at 26th and Railroad Streets in Pittsburgh’s Strip District. 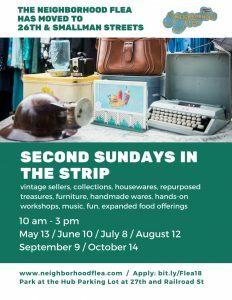 Parking at The Hub at 27th and Railroad is only $3 for Flea days!